After a 5-year journey, NASA’s Juno spacecraft has arrived at Jupiter, the largest planet in our solar system. The spacecraft entered a novel polar orbit around the gas giant on July 4. From this vantage point, Juno is poised to improve our understanding of Jupiter’s formation and, in turn, the processes that led to formation of our solar system. On its journey to Jupiter, Juno became both the most distant solar-powered and the fastest spacecraft in history. To achieve orbit, the spacecraft turned and executed a 35-minute main engine burn to slow down enough to be captured by the gas giant. Soon after the burn, Juno turned once again to point the 18,698 individual solar cells that power the spacecraft back at the Sun. When a simple series of tones signaled Juno’s success, the team in the mission control room at the Jet Propulsion Laboratory in Pasadena, Calif., erupted into cheers, applause, high-fives, and hugs. “Tonight, through tones, Juno sang to us, and it was a song of perfection. The spacecraft worked perfectly, which is always nice when you’re driving a vehicle with 1.7 million miles on the odometer,” said Rick Nybakken, Juno project manager from JPL. Juno has the technology to measure, for the first time, the atmosphere below Jupiter’s cloudy façade. Instruments will map variations in composition, temperature, cloud opacity, and dynamics to depths greater than 100 bars at all latitudes. The Juno spacecraft is designed to unmask the mysteries that lie beneath the swirling clouds on Jupiter’s visible facade. 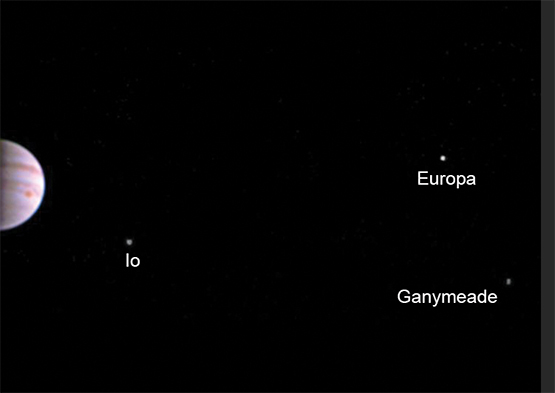 Over the course of the mission, Juno will orbit Jupiter 37 times. With a suite of nine instruments, scientists will look at the internal composition of Jupiter to determine how deep the colorful surface features persist, mapping the atmosphere’s composition, temperature, clouds, and patterns of movement to unprecedented depths. 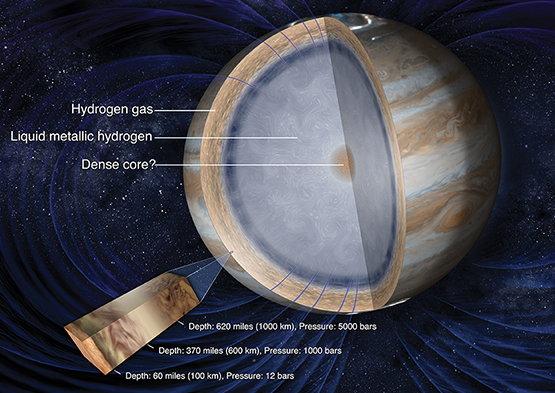 Juno will measure the amount of water and ammonia in Jupiter’s atmosphere and help determine if the planet has a core of heavy elements, constraining models on the origin of this giant planet and thereby the solar system. 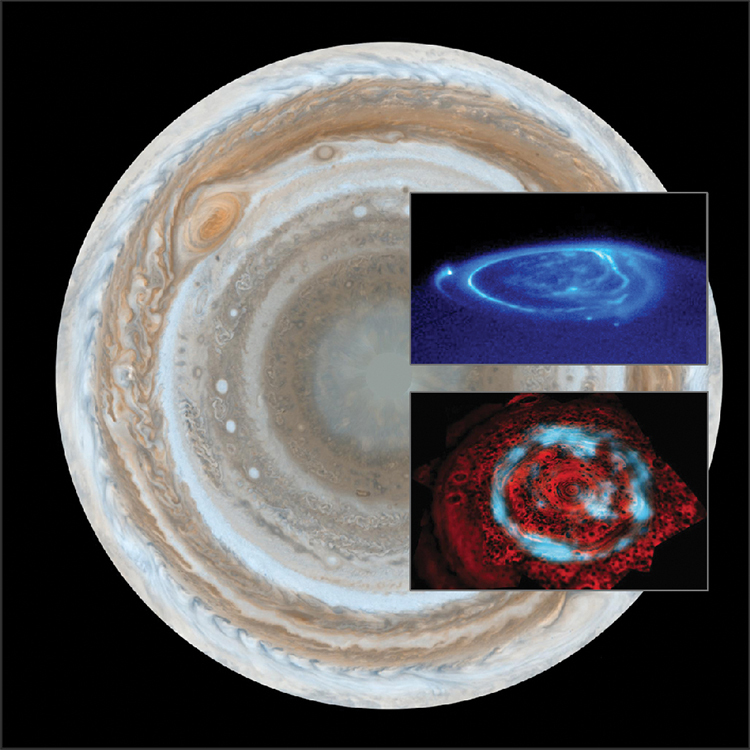 Scientists are also looking for evidence of pressurized hydrogen that is believed to generate Jupiter’s magnetic field, creating a powerful magnetosphere that sparks the brightest aurora in our solar system. SwRI built two science instruments aboard the spacecraft critical to understanding these phenomena. The Jovian Auroral Distributions Experiment (JADE), led by SwRI’s Dr. Phil Valek, will measure the auroral electron and ion populations along the planet’s magnetic field lines to determine which particle populations create the Jovian aurora. The Juno Ultraviolet Spectrograph (UVS), led by SwRI’s Dr. Randy Gladstone, will image ultraviolet emissions from the Jovian aurora, allowing space scientists to correlate auroral observations with JADE measurements. The Juno mission is the second planetary mission flown as part of NASA’s New Frontiers Program. NASA’s Jet Propulsion Lab manages the Juno mission for the principal investigator. Lockheed Martin of Denver built the spacecraft. The Italian Space Agency contributed an infrared spectrometer instrument and a portion of the radio science experiment. The SwRI-built UVS and JADE instruments are designed to characterize and explore the three-dimensional structure of Jupiter’s polar magnetosphere and auroras.